I might as well make this giveaway round up a weekly or twice weekly post, there are so many wonderful bloggers & companies out there with amazing giveaways! I love sharing a few of the ones I find interesting. Someday soon, hopefully very soon, I will be having some giveaways of my own ;) Meanwhile, I’ve found some wonderful Mother’s Day giveaways for you to enter! Hmmm, how many times can I use the word giveaway in my first paragraph anyway? Dee over at Two of a kind, Working on a Full House is featuring a giveaway for a 2-year subscription to All You magazine! This mag features an amazing amount of useful coupons, scrumptious recipes and countless tips, articles, crafts and more! To enter you need to subscribe to Dee’s email newsletter. She offers many ways to gain extra entries. While you’re there don’t forget to enter to win a pair of adorable Spring Flower Drop Earrings. They are handmade with love by Melissa of ShimmerMeBlue. They would be the perfect accessory for summer picnics and outings! 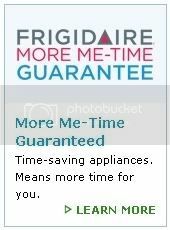 Frigidaire is launching a new appliance collection that they guarantee will free up more me-time for Moms! 250 new appliances all specifically designed to give moms more time for themselves and their families. If you would like a chance to win a suite of NEW Frigidaire appliances then complete the “5 Things” survey. Think of some fun and/or relaxing ways you would spend an extra hour. 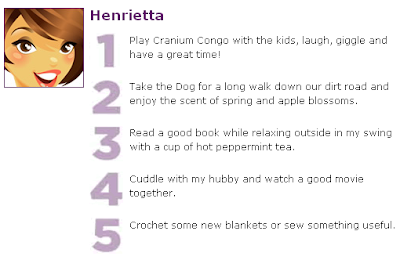 Take a peek at my 5 Things list below. You can also enter the Daily Dare contest on the site for a chance to win a NEW Frigidaire Affinity front-load washer and dryer. These two dirty-laundry-pile-shrinking machines are S-W-E-E-T! The washer offers a super fast 28 minute quick wash cycle! The 7.0 cubic foot dryer is the largest standard sized dryer on the market. I can’t imagine what a pleasure laundry would be if I had this pair. You can enter once a day through June 30th. That’s it for tonight. I need to get to bed so I can rest up. Tomorrow morning I’m headed to an annual neighborhood yard sale in the next town over. We’ll have a full truckload with my Mom, Step-Dad, daughter and possibly a few others riding along. I’m keeping my fingers crossed to find shorts for Miss A. and myself. It seems we have NONE! Miss A. outgrew every single pair of hers over the winter. Enjoy the weekend! Wow, you sound like real treasure hunter. 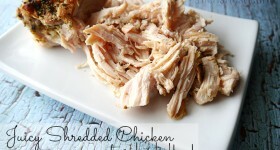 Thanks for posting about so many wonderful give aways! I’m so glad you find them useful! I love finding new contests, especially ones I haven’t heard about a zillion times :) Enjoy your weekend! Next Post: Have a Wonderful Day!